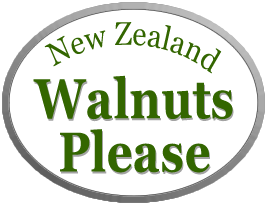 Recipes provided by New Zealand walnut growers. Approved and prepared by a trusted food professional. Simple, easy to make and always full of flavour. Mix base ingredients to a smooth dough, form into a roll 6cm in diameter and wrap in cling film. Refrigerate until firm, about 1 hour. Cut into 3–4mm rounds. Brush with the beaten egg, put a walnut half on top and place on a baking tray lined with baking paper. Bake at 180ºC for 12­ – 15 minutes or until golden. Traditional meringues with a walnut flavour. Surprisingly nice! Preheat oven to 210ºC. Line two baking trays with baking paper. Beat the egg whites while gradually adding the sugar. Beat to a stiff peak consistency. Gently fold in the ground walnuts. Use a pastry bag with a fluted nozzle to form meringues on the baking sheets. Put them in the preheated oven, immediately turn off the heat and leave them in the oven for 1 hour. With creamy blue cheese and crab apple jelly. Put the first five ingredients in a food processor and mix to combine. Add the butter and water and briefly mix to a crumbly dough. Rest for 30 minutes. Shape into walnut size balls and squeeze together. Place on a baking tray lined with baking paper and squash flat with the bottom of a glass covered with cling wrap. Bake for 10 to 12 minutes or until they are done. Serve with creamy blue cheese and crab apple jelly. Note: Because of the high oil content of the walnuts in them, these biscuits will not stay crisp. Alternative shortbread with the crunch of the nuts and the interesting complimentary flavour of figs. Spread the walnuts on a baking tray and toast for a few minutes at 180ºC . Allow to cool completely. Beat butter and sugar together. Add the white flour, rice flour, walnuts, figs and lemon rind and mix to a stiff dough. Preheat oven to 160ºC. Line a baking tray with baking paper. Slice logs into thin slices about 8mm thick and 40mm in diameter and place on the tray. Bake for 16–20 minutes until firm – do not overcook! When ready they should be just starting to colour. Remove to a cooling rack and allow to cool completely on a wire rack. Store in an airtight container. Great with blue cheese and relish. Put the walnuts and rolled oats into a food processor and whizz to a very fine crumb texture. Melt the butter and honey in the hot water. Add this to the walnut/oat mixture along with the salt, baking soda and thyme. Whizz again to combine all into a smooth dough. Turn out on to the bench top and knead into a dough that you can roll out to about 3mm thick. Cut into shapes as desired and put them on baking trays lined with baking paper. Prick each biscuit several times to cook more evenly. Bake until golden at the edges, about 12 to 15 minutes.